A classic, enchanting document of Scottish folklore about fairies, elves, and other supernatural creatures. 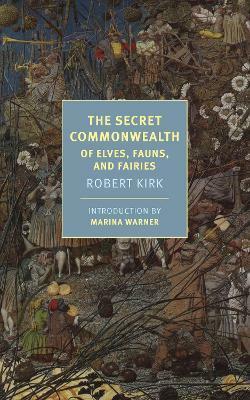 Late in the seventeenth century, Robert Kirk, an Episcopalian minister in the Scottish Highlands, set out to collect his parishioners' many striking stories about elves, fairies, fauns, doppelgangers, wraiths, and other beings of, in Kirk's words, "a middle nature betwixt man and angel." For Kirk these stories constituted strong evidence for the reality of a supernatural world, existing parallel to ours, which, he passionately believed demanded exploration as much as the New World across the seas. Kirk defended these views in The Secret Commonwealth, an essay that was left in manuscript when he died in 1692. It is a rare and fascinating work, an extraordinary amalgam of science, religion, and folklore, suffused with the spirit of active curiosity and bemused wonder that fills Robert Burton's Anatomy of Melancholy and the works of Sir Thomas Browne. The Secret Commonwealth is not only a remarkable document in the history of ideas but a study of enchantment that enchants in its own right. First published in 1815 by Sir Walter Scott, then re-edited in 1893 by Andrew Lang, with a dedication to Robert Louis Stevenson, The Secret Commonwealth has long been difficult to obtain--available, if at all, only in scholarly editions. This new edition modernizes the spelling and punctuation of Kirk's little book and features a wide-ranging and illuminating introduction by the critic and historian Marina Warner, who brings out the originality of Kirk's contribution and reflects on the ongoing life of fairies in the modern mind. Robert Kirk was born in Scotland and studied at Edinburgh University and at St. Andrews. Ordained as a minister, he was the first author to produce a complete translation of the Scottish metrical Psalms into Gaelic, translated many other religious works into the Scots Highland dialect, and was the editor of a new Irish edition of the bible. He served at the parish of Aberfoyle until his early death in 1692. Legend says he collapsed on "fairy hill" south of the village, where today his spirit is entombed in a tree, known as "The Minister's Pine. "Marina Warner is the author of a number of works of fiction and non-fiction. In 1994 she became only the second woman to deliver the BBC's Reith Lectures, published as Managing Monsters: Six Myths of Our Time, and was awarded the Chevalier de l'Ordre des Arts et des Lettres (France) in 2000. A Fellow of the Royal Society of Literature since 1985, she lives in London.